On a routine flight six years ago from Panamá City, Panamá to David, Panamá, two men became instant friends due to a Southern accent and their shared affection for the Lowcountry. Can you blame them? ?Originally from Panamá, Alexis Gallardo attended Georgia Tech in Atlanta, Georgia to pursue a Chemical Engineering degree. While studying at Georgia Tech, Alexis often visited South Carolina and considered the southern state to be his home away from home in the United States. After graduation, Alexis moved back to Panamá to create and formulate recipes for Proluxsa, his family’s manufacturing and distribution company that has been the top exporter of natural vinegar in Central America since 1964. Smith Anderson, a native North Carolinian, was living in David, Panamá at the time while working for an oceanfront resort in sales and marketing. After their initial meeting, Alexis and Smith began dreaming of their own sauces and recipes. 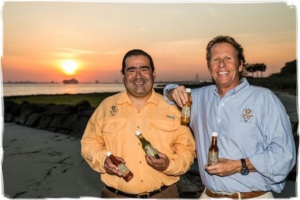 After a year of experimenting in the Panamanian fields and tasting their all-natural recipes, 9°80° Gourmet Sauces and Marinades was born! Alexis and Smith are proud and excited to share their creations that have come straight from the fields of Panamá to your kitchens and tables. Remember your 8th grade geography class? Latitude and longitude are units of measurement in degrees that depict a location on a map. 9° and 80° are the geographical coordinates of Panamá City, Panamá, where our ingredients grow freely and are bottled before being shipped to the United States. Coincidentally (or maybe not), Charleston sits at 80° longitude and is directly above Panamá City, Panamá. Alexis and Smith are connected not only through their friendship, love of South Carolina and gourmet sauces, but there’s also a direct link between their two cities, hence the name 9°80° Sauce! 9°80° sauces are created from habanero, jalapeno and bell peppers, plus cumin, cilantro, garlic and vinegar, which are all ingredients proven to be good for you in so many ways. Our bright, colorful peppers are rich sources of Vitamins A, C and B6. These peppers also include Capsaicin, a chemical compound that is rich in antioxidants. This is the stuff that strengthens our body’s ability to fight disease. It’s also the stuff that puts the heat in hot peppers, so Capsaicin is to blame when your tongue is on fire and tears fill your eyes. Did you also know that Capsaicin has been known to kick-start metabolism while causing you to eat less and lose weight? This means that flavoring your foods with our 9°80° sauces just may help you fit into those favorite jeans that have been a bit snug lately! That’s exciting news in our book! We also use wonderful herbs and spices in 9°80° sauces, each with their own special benefits. Cumin, a member of the parsley family, has a nutty flavor that is found in the cuisines of many cultures. 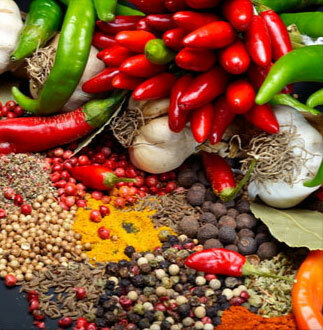 We are certain you have tasted it in many of your favorite Mexican or Indian dishes. It gives the perfect amount of flavor and spice to each of our 9°80° sauces. Studies have shown that cumin can help with digestion, insomnia, common colds and memory. We don’t know about you, but we can always use a memory boost or help with slumber every now and then! Two other ingredients used to craft 9°80° sauces that are beneficial to our health are cilantro and garlic. These items are considered to be nature’s best antioxidant foods. Regular intake of cilantro has been proven to help reduce bad cholesterol (LDL), increase good cholesterol (HDL) and may include the ability to control blood sugar. Cilantro is also rich in antioxidants, helping to reduce free radical damage from sunlight. 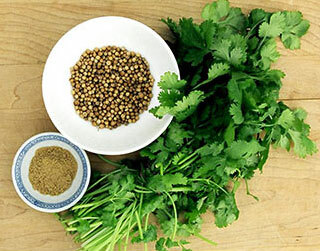 Research shows that daily use of cilantro helps in preventing skin cancer. Although garlic often gets a bad rap, it is one of the most valuable and versatile foods on the planet and widely recognized as a health-enhancing supplement. Like cumin and cilantro, garlic is also rich in antioxidants. Garlic also has been proven to lower blood pressure, reduce cholesterol and regulate blood sugar. The last but certainly not least of our special ingredients is vinegar. Vinegar has many helpful qualities with one being that it is high in acetic acid. If you aren’t familiar with acetic acid, it can increase the body’s absorption of important minerals in our foods. Therefore, including vinegar in foods with meals might improve your body’s ability to absorb essential minerals. Vinegar also is believed to help the body balance blood glucose levels. This can help people suffering from diabetes, as well as individuals who want to keep their glucose and energy levels stable throughout the day. So, as you see, 9°80° sauces contain many ingredients that have been proven to be beneficial to our health. When you add your favorite 9°80° flavor to your specialty dishes and comfort foods, feel confident that our sauces are all natural and good for you. Grab your favorite flavor and Get Sauced with 9°80° today!